The Beauty Scoop! : Marc Jacobs Window Shopping at Harvey Nichols Online... Lusting After Lots of Items! 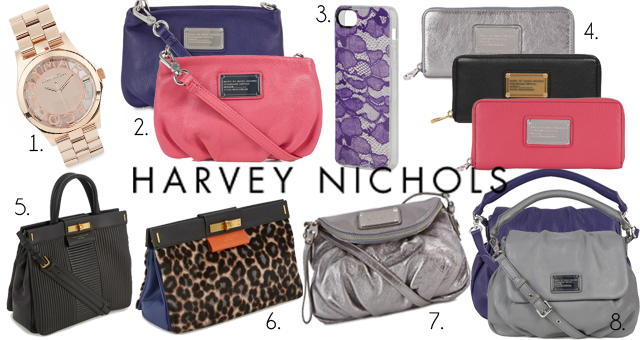 Marc Jacobs Window Shopping at Harvey Nichols Online... Lusting After Lots of Items! I spend hours window shopping online, filling my baskets with items that I desire yet can never afford, or justify spending my money on due to one thing or another. Today is no exception, I've been on the Harvey Nichols website lusting after Marc by Marc Jacobs items and the image above is just a small (very small, might I add) selection of items that I want need in my life. 1. Marc Jacobs 'Henry Rose Gold Tone Watch' £229. 2. Marc Jacobs 'Q Percy grained Leather Cross-Body Bag' £175 in both pink and purple. 3. Marc Jacobs 'Burn Out Lace iPhone5 Case' £30 in purple (if I had an iPhone not an S4). 4. Marc Jacobs 'Q Grained Leather Wallet' £170 in pink, silver and black (£175). 5. Marc Jacobs 'East End Madame Hill Quilted Leather Tote' £530. 6. Marc Jacobs 'East End Lady Rei Leopard Print Clutch' £385. 7. Marc Jacobs 'Q Natasha Mini Leather Cross-Body Bag' in silver £260. 8. Marc Jacobs 'Q Lil Ukita Grained Leather Shoulder Bag' in purple and grey £350. Grand total (of my restrained shop): £2999... whoops. There are also other Marc Jacobs items I am lusting after on the site - these are just the cream of a very large crop, and items from many, many other brands on there too... but until I win the lottery, I can only dream and have my basket empty itself, rather than be checked out. In fact, I have just come to the conclusion that I do too much 'adding to cart' and not enough 'checking out' - it's a sad world I live in, ha. Do any of you guys also window shop like this? What, if anything do you currently have your eye on? Written for, and in association with Harvey Nichols.